Kent presents the Clothes Brush which has been designed to help keep your clothes clean. Made with real bristles that are perfect for gently removing dust, lint, and stray hairs from clothing. Keeping your clothes looking good as new has never been easier. Kent started out as G. B. Kent & Sons PLC back in 1777 as a family owned business. Today, Kent is the world's oldest brush manufacturer as well as one of the oldest companies in Great Britain. Proudly displaying the Royal Warrant of Her Majesty the Queen, Kent continues to make high-quality products; including hair brushes, combs, makeup brushes, body brushes, shaving brushes, and clothing brushes. Experience the quality that has continued for 240 years. PERFECT ADDITION TO YOUR DAILY ROUTINE: The Clothes Brush is the perfect addition to your daily routine. 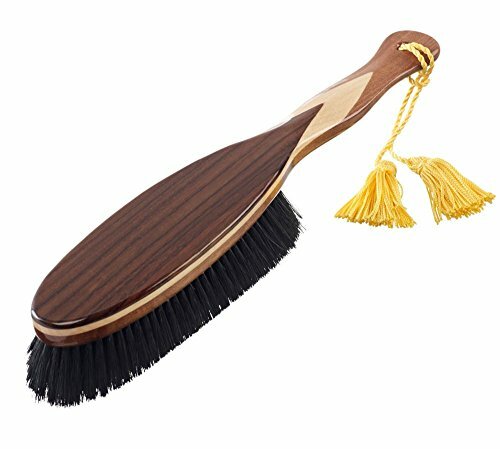 This fantastic brush from Kent helps to ensure that your clothes look as good as they did when you bought them. MADE WITH REAL BRISTLES: Kent brushes are made with real bristles to help give you one of the best brushing experiences. The real bristles are perfect for gently removing dust, lint, and stray hairs from clothing. KEEP YOUR CLOTHES LOOKING SHARP: Kent has created a fantastic line of brushes designed to help keep your clothes, shoes, and other brushes clean. Keeping your clothes and shoes looking good as new has never been easier.